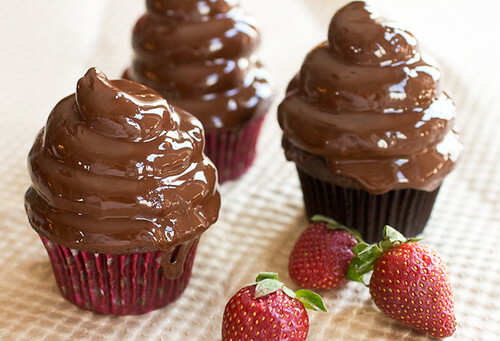 Chocolate covered strawberry cupcakes: homemade chocolate cupcakes topped with fluffy strawberry frosting and dipped in chocolate. These are showstopper cupcakes! It’s this time of year that always makes me jealous of you Southerners. When the farmer’s markets are opening up and you’re out picking berries, we’re digging out of 24+ inches of snow here in New England. Don’t get me wrong, I love love love snow, as my instagram photos were evidence of over the weekend, but put a bowl of fresh and perfectly ripened strawberries in front of me, preferably ones I picked with my own hands, and I’m totally happy. I mean, completely and utterly happy! So since Valentine’s Day is just a few days away, I’ve been putting together a few strawberry recipes for the two of us here, using up as many juicy organic Florida strawberries as I can get my fat little hands on. Not surprisingly, they all involve chocolate too. Like this peanutella and strawberry toast. Dessert for breakfast bliss! 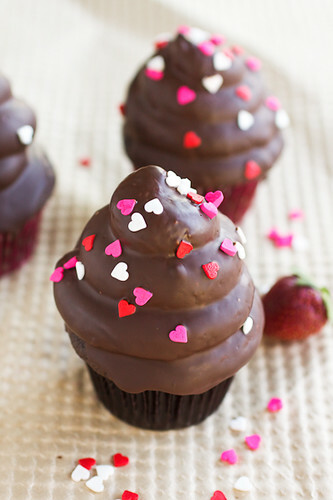 However, these chocolate covered strawberry cupcakes may just have topped my list of favorite things in recent memory. I paired my favorite and go-to chocolate cupcake with strawberry Swiss meringue buttercream and then dunked the frosting in a coating of melted chocolate. Yup, you heard all of that right! They are akin to the concept of Martha Stewart’s hi-hat cupcakes but hello! Strawberry Swiss meringue buttercream! 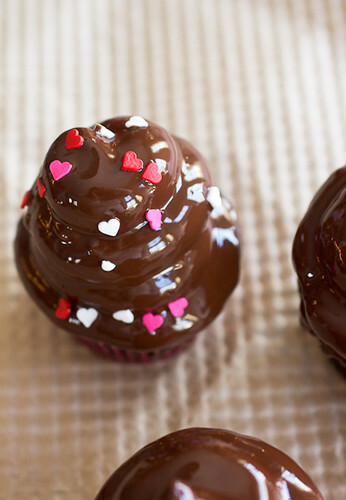 Dipped in chocolate! 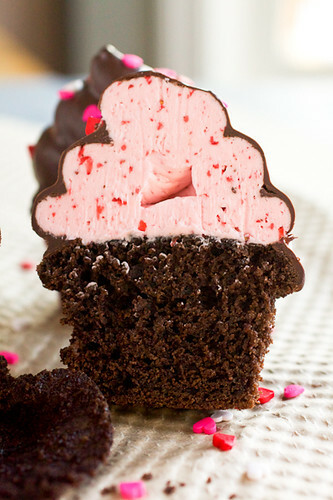 How could you possibly go wrong with a cupcake that tastes like a chocolate dipped strawberry?! If you’ve never had Swiss meringue buttercream before, let me tell you about it for a few seconds. Because you NEED this buttercream in your life. Unlike American buttercream, which can be very thick and sweet, Swiss meringue buttercream is kind of a like a silky frosting dream come true. There is lots of butter in this recipe, which when added just at the right time and when whipped enough, yields a light and buttery frosting. Rather than beating the butter at the start of the recipe, you’ll drop softened butter cubes into a whipped hot sugar and cooked egg whites mixture and basically whip the ish out of it until a cloud-like frosting takes shape. It’s a magical transformation to make happen in your own kitchen! Making Swiss meringue buttercream has always been one of my favorite frostings to make because of this! In the past, I’ve made a delicious vanilla Swiss meringue buttercream but for this strawberry version, you’ll whip a small amount of pureed strawberries into the frosting until a pink berry cloud emerges. It’s just so perfect! 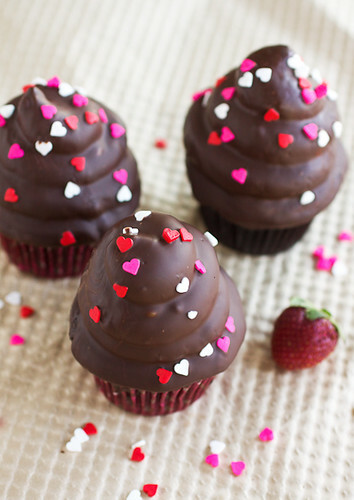 So you if you have some extra time to spare, go and make these chocolate covered strawberry cupcakes for your loves. They will make everyone happy! This recipe will yield 12-15 cupcakes, enough frosting (about 5 cups) to liberally frost those cupcakes, and plenty of chocolate for coating them. All recipes can be doubled to yield enough for 24-27 cupcakes. The instructions for these cupcakes may seem a little long and somewhat daunting but I made sure to include some helpful tips. These cupcakes would be a super fun project to do with your kids (especially the dipping part), with a group of girlfriends, or by yourself if you need some baking solace, like I often do. To make the cupcakes: Preheat the oven to 350° F. Line 1 ½ standard cupcake pans with paper cupcake liners. In a small bowl, whisk together the cocoa powder and hot water until smooth; set aside. In a medium bowl, whisk the flour, baking soda, baking powder, and salt together; set aside. In a medium saucepan set over medium heat, combine the butter and the sugar. Heat, stirring occasionally to combine, until the butter is melted. The butter may not fully incorporate into the mixture but that’s ok. Remove the mixture from the heat and pour it into the bowl of a stand mixer fitted with a paddle attachment. Beat on medium-low speed, 4-5 minutes, until the mixture is cooled. Beat in the eggs, one at a time, mixing well after each addition. Scrape down the sides of the bowl as needed. Blend in the vanilla and then the cocoa mixture and beat until incorporated. With the mixer on low speed add in the dry ingredients in two batches, alternating with the sour cream, beating just until combined. Using a rubber spatula, scrape up the bottom of the bowl to make sure no stray streaks of flour remain – quickly mix them into the chocolate batter. With a large cookie/ice cream scoop, fill each cupcake liner about ¾ of the way full. Overfilling the liners will cause the cupcake tops to bake onto the pan – you don’t want that. Bake for 18-20 minutes or until a toothpick inserted in the center comes out clean and the cupcake is “springy” when gently pressed on the top. Allow the cupcakes to cool in the pan for 3-5 minutes, then transfer to a wire rack to cool completely. To make the strawberry Swiss meringue buttercream frosting: Puree the strawberries in a food processor until small chunks of strawberry remain and the mixture looks like jam; set aside. In the well-cleaned and dried stand mixer bowl, place the egg whites and sugar. Set the bowl over a pan of shallow water and bring the water to a simmer – the bottom of the bowl should not touch the simmering water. While the water simmers, lightly whisk the egg whites and sugar constantly. Once the mixture has reached a temperature of 160 to 165° F on a candy thermometer and is completely smooth (i.e., there is no gritty sugar remaining when you rub a little of the mixture between your fingers), remove it from the heat and attach it to the stand mixer with the whisk attachment fitted. Gradually increase the speed up to medium-high, whisking until the mixture is glossy and completely cool, about 8 minutes. The bottom of the bowl will be nearly cool as well. To make the chocolate coating: Add the finely chopped chocolate and canola oil to a medium bowl and set the bowl over a small pan of shallow water. Bring the water to a simmer – the bottom of the bowl should not touch the simmering water. Stir the chocolate and oil together while the water simmers until the chocolate is completely melted. Alternatively, you can melt the chocolate and oil together in the microwave for 30 second intervals, stirring after each interval. Pour the chocolate into a wide and short cup (mine was 12 oz, about 3 ½” wide by 3″ tall). The cup should be wide enough so that you can dip the cupcake inside without rubbing against the sides – check the cup size before you pour the chocolate in! Allow the chocolate to cool for 15 minutes. To frost and dip the cupcakes: Transfer the frosting to a disposable piping bag fitted with a large pastry tip (I used Ateco 809) or a zip-top bag with a corner snipped off and a pastry tip slipped in the corner. Pipe the frosting onto the cupcakes in large stacking swirls. Be sure to press the first swirl of frosting somewhat into the cupcake to make sure it sticks to the cupcake – this is important when you go dip the frosting into the chocolate coating as you don’t want the frosting falling off into the chocolate. Set the cupcakes on to a wire rack with a piece of parchment or wax paper or aluminum foil underneath the rack. Take a cupcake, turn it up-side-down, and steadily dip it down into the chocolate up to the point with the frosting meets the cupcake. Pull it straight out of the chocolate, allowing the extra chocolate to drip off into the cup. Turn the cupcake right-side-up and place it on the wire rack. The frosting should be completely covered with chocolate but if any shows, use a knife to drizzle some chocolate into the spots where the frosting shows. Repeat with remaining cupcakes. Allow the chocolate coating to set-up – this can be done at room temperature or in the fridge for 15 minutes. Store finished cupcakes in an airtight container at room temperature for 2-3 days.